Description: The exquisite Honeycomb patterned Clear Frosted Glass shade is created with high fired, state of the art kiln formed art glass, the famous Meyda Tiffany copper foil construction, and old world molds. 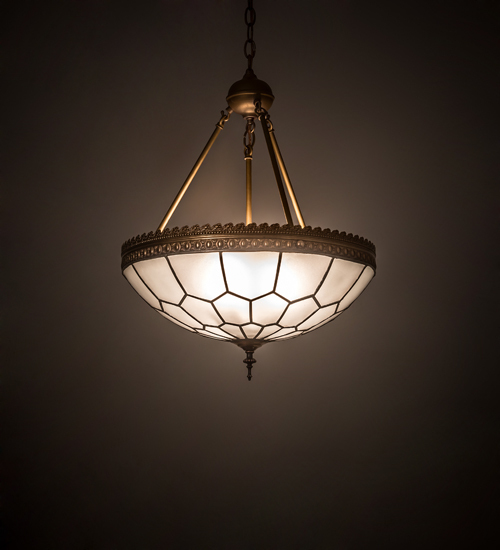 This elegant dramatic lighting fixture and will make a stunning design statement in any room. The beautiful shade is complemented with an exquisite, intricate patterned Solid Brass border, along with hardware and matching finial featured in a Matte Buttered Brass finish. This fixture is handcrafted by highly skilled artisans in our 180,000 square foot manufacturing facility. Custom sizes, styles, and colors are offered, as well as dimmable energy efficient lamping options such as LED. This fixture is UL and cUL listed in dry and damp locations.